Organic. Unperfumed liquid handsoap with shea butter for sensitive skin. 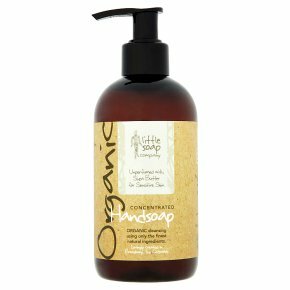 Organic cleansing using only the finest natural ingredients. Lovingly created in Broadway, The Cotswolds. Free from detergents, SLS, alcohol, parabens, sorbates, silicones, sulphates and palm oil. Cruelty Free International. Vegan. Directions: Rub a small amount into hands and rinse well with warm water.